Simply fry some onion, red or green peppers and garlic gently in olive oil until soft, you can add some chorizo if you wish. Add some chopped herbs, oregano or thyme work best. While your simmer the beans gently, take the skin of a Morcilla, I particularly like to cook the Morcilla (black pudding) made with rice, in Spain is known as “Morcilla de Burgos”. It is less bloody and the rice works great on this dish. Slice the Morcilla and in a frying pan with a little bit of olive oil, fry it breaking it up with a wooden spoon until crispy. All you need is a big deep bowl to serve the bean stew with some Morcilla on top. 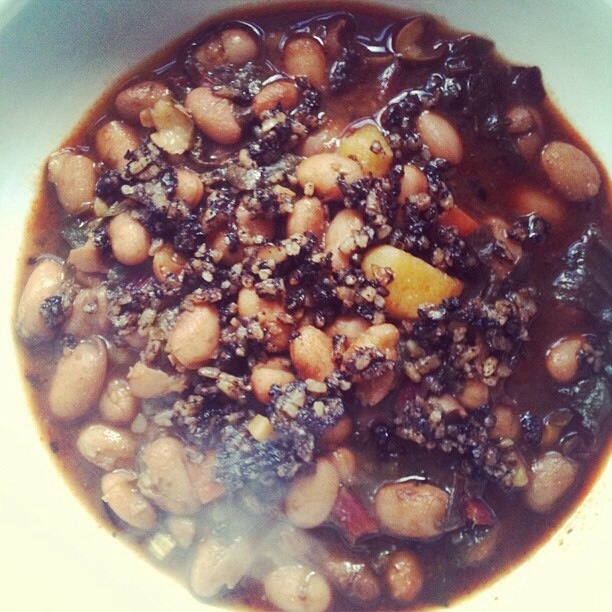 This entry was posted in catering, cooking, fitness, food, health, home, home cooking, kitchen, love, nutrition, spanish, Uncategorized and tagged beans, food, spanish, stew, warm, winter. Bookmark the permalink.